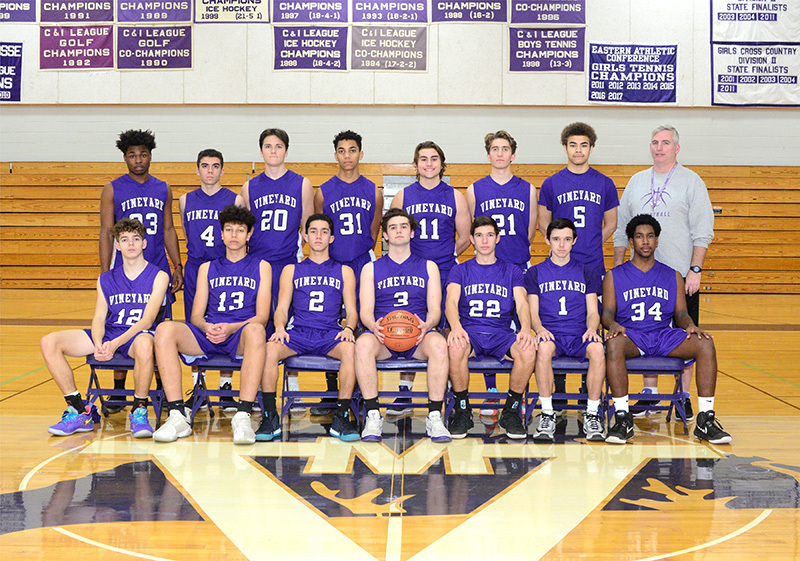 With one senior lost to graduation, Vineyard Coach Mike Joyce has a host of familiar faces back in the lineup with a year of experience under their belts. The Vineyarders have moved from the Eastern Athletic Conference, where they won seven titles (four outright and three shared) in nine seasons. This season, the Vineyarders will play league rivals Cape Cod Academy, Cape Tech, Monomoy, Nantucket, Sturgis East, Sturgis West, and St. John Paul II. Kane Araujo, who coached the Vineyard freshman for the past two seasons, will now lead the JV team. James Jennings is the new freshman coach. The Vineyarders have a good mix of senior leadership and younger scoring talent. Seniors Sam Wallace and Matt Morris are the team captains. Dylan Dyke, Owen Porterfield, and Talon Russillo complete the senior quintet on the roster. Returning juniors Jared and Jeremy Regan, Aidan Araujo, and Solon Oliver, are joined by newcomer Justin Chin. Rammon Dos Santos, Aiden Rogers, and Mike Trusty are the varsity sophomores. The Vineyarders also don’t lack for depth. “We can probably go nine or 10 deep, without much falloff,” Coach Joyce said. Somehow, the energy and intensity that Coach Joyce observed in practice failed to materialize in the opening quarter of the Vineyarders’ opening game against the Monomoy Sharks, Tuesday in Harwich. The Sharks feasted on their guests’ slow start and ran up a 25-6 lead after the first quarter. The Vineyarders gamely fought back and played well the rest of the way to force overtime with the score tied at 68-68, but Monomoy pulled away in the extra period to win, 79-69. “We were lethargic and not playing with the intensity we needed in the first quarter,” Coach Joyce said. The Vineyarders also had three players foul out, which hurt down the stretch. Jared Regan led MV with 17 points, Mike Trusty scored 13, Dylan Dyke and Rammon Dos Santos had 11 each, and Aidan Araujo added nine more. The Vineyarders look to even their record in the home opener against Sturgis East Charter School on Dec. 13. The opening tip is 5:30 pm. The JV team supplied the silver lining in the Vineyard trip to Monomoy on Tuesday, beating the Sharks 58-36. Ty Matthews was the high scorer with 17 points.